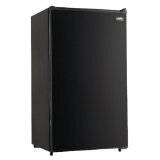 This Danby DCR34W Mini Fridge model has a 3.2 cubic foot capacity with push-button defrost. It has 4 wire shelves, a can dispenser in the door, tall bottle storage, and built-in mini freezer section. Also features a mechanical thermostat, and a molded egg storage. Comes in white and black. 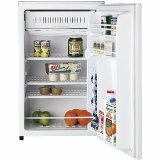 This Sanyo SR-2570M Mini Fridge has 2 interior shelves and a full-range thermostat control. It has a cold-storage ice compartment with 2 shelves and a can dispenser in the door. 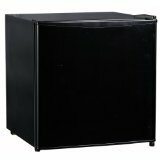 This is a 2.5 cubic foot storage capacity Mini Fridge with full range thermostat dial control. This unit measures 18 5/8 inches by 25 1/4 inches by 19 5/8 inches and comes with a one year warranty on parts & labor. 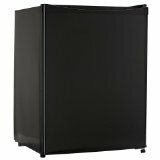 This compact sized 1 2/3 cubic foot capacity fridge/freezer combo has 7 adjustable temperature settings and a reversible door handle. It includes a slide out wire shelf, door storage shelves and a half-width freezer area. Features a drip tray and manual defrost and also includes an ice cube tray. Unit measures 18 5/8 inches by 17 1/ inches by 19 5/8 inches and comes with a one year limited warranty. This counter high model SR-3620K has 3 interior and 3 door shelves, a crisper and full width freezer. It uses a full-range adjustable thermostat and reversible door for easy access in small places. Available in black and white. Unit measures 18 5/8 inches by 33 1/2 inches by 19 7/8 inches and comes with a one year warranty on parts & labor. 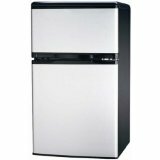 The compact 20 inch x 18 inch x 21 inch Igloo FR180 1.7 Cubic Foot Stainless Steel Door Fridge uses a low amount of energy and is CFC free. It has slide out shelves, reversible door and invisible door handle. Perfect fit for a dorm room or small office or apartment. The Sanyo SR-A2480K Mid-Size Fridge model has a reversible door and adjustable temperature control. It offers 2 interior shelves that are slide-out and and have coated wire, 2 door shelves and storage for beverage cans on the door. The refrigerator has a capacity of 2 2/5 cubic feet and a half-width freezer. Unit measures 17 3/4 inches by 18 5/8 inches by 24 7/8 inches. The Igloo FR834a 3.2 Cubic Foot capacity refrigerator / freezer combination has a reversible door, transparent veggie drawer and a glass shelf. It uses an adjustable thermostat control and includes an ice cube tray with slide out wire shelving. Unit measures 22 inches by 18 inches by 46 inches. 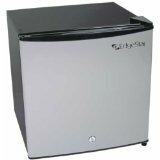 This Edgestar model CRF150SS can convert from a 0° Fahrenheit freezer to a fridge with full range temperature control up to 40° Fahrenheit. It has a reversible door and comes with a lock and two keys. If you have a problem with everyone taking your lunch out of your dorm room or office frig, this unit solves that problem! 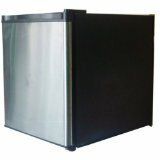 This General Electric GMR04BANWW Spacemaker 4.3 cubic foot mini-fridge has an ice tray and a .42 cubic foot freezer compartment. The refrigerator fresh food section consists of 3.89 cubic feet of space. It contains 3 door shelves and 2 1/2 adjustable wire cabinet shelves. Door handles are recessed and color matched. 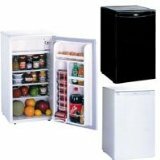 This Magic Chef MCBR170BMD 1.7 cubic foot mini-fridge model has a reversible door, adjustable legs and shelving. It uses a push button defrost option and has a can dispenser in the door. Unit measures 17.3 inches wide by 20.1 inches high by 17.8 inches in diameter.